I have lived in many homes, cities and states in my life. 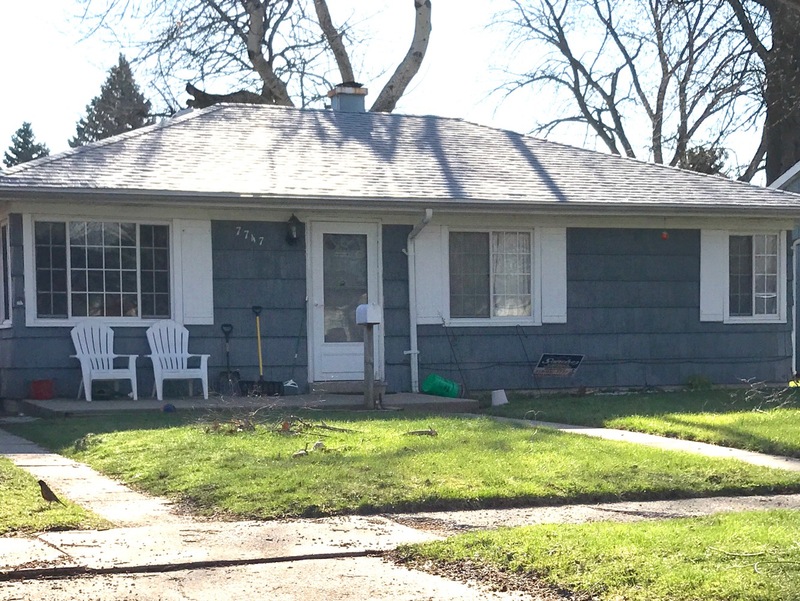 As a child, the place I had the most memories in is this humble home in Hammond, IN, that my parents rented from the time I was 8 until I was 13. That was by far a record as I can recall having lived in 9 different places up to that point. That record was not broken until I bought my first home at the age of 21. This is the place where my love of socks was born. Clearly, this home was important for many reasons. I know I've mentioned we were poor, but occasionally during these years, when I would go to the grocery store with my mom, she would let me choose a new pair of socks from the rack of dollar socks that was near the registers. I would labor over this decision. I would be nearly giddy with the choices. I would take home this prize and I would wear them pretty much nonstop all weekend. You cannot imagine the joy a simple pair of socks gave me. As a result, I grew up to have a bit of a sock obsession. It was a well documented joke in my family. When I was in my early 20's and had to have surgery on my toes, my mom made me a bouquet of socks in a vase and brought them to me at the hospital. Of course I loved it! My girls have been gifting me with socks for as long as they have been buying me gifts. I still get that little thrill with a fresh pair. When I think of where my deep gratitude comes from, I am often led back to those moments, standing in front of that spinning rack of socks. It may sound silly, but imagine a little girl with so little, that a pair of dollar socks made her deeply happy. I know most people could not imagine that. I know my own girls could not. And while often my heart breaks for that little girl, I also can't help but be thankful because I can't imagine that I would be the person I am today without those experiences. Bitterness cannot grow where gratitude lives. It seems it was a natural transition for me to become a sock knitter. When we look back on our lives, it's easy to see how all the moments before, bring us to where we are now. And I love where I am now, so I have to love what brought me here. Sock knitting is meditative for me. I love wearing them of course, and I love choosing the yarn combinations and patterns and will often obsess over these choices as I used to obsess over those sock choices as a little girl, but more than anything, I love making stitch after tiny stitch, round and round in a circle, sometimes with no other thought than what my needles are doing, sometimes with silent prayers, memories of the past or dreams of what's to come, until suddenly I look down and I have this little object that gives me joy and which will hopefully make the person they might be gifted to just as happy as they make me. For the past several months knitting socks has been a special kind of therapy for me, shifting my focus to something positive, giving me something I could control, healing my spirit. Hand knitted socks, aren't just socks to me. They are love filled hugs for your feet and when I give a pair to someone, I am giving them a bit of myself knit into every imperfect stitch. I know the feeling! While we weren't moved around a lot, there were times there wasn't much money for food. We never really knew as kids the struggle of my parents, because on those days Mom made special "Breakfast for Dinner Pancakes"! To us a special treat to my parents a way to make a dollar really stretch!! I still make the occasional "Breakfast for Dinner Pancakes", but now it really is a treat!! I was fortunate as a child to grow up in the same home from the age of 3 to 17. I love your knitted socks. I hope you are doing well Jen, I think about you a lot. Beautiful - post and socks! Ok, this is just about the best, heart-warming (and feet warming ;-) ) post ever. I am not a knitter, but I AM a sock lover! Hoping and praying your healing is steady and forever! Oh I knew we were kindred souls. I have always loved sock and have to admit I have 2 huge baskets of them. My feet once the weather changes seem to always be cold so I can use that as a excuse to wear different socks during the day and then in the evening. Your socks you create are a work of art. I am so glad to hear the meditative tone in your post. I continue to think of you and pray for you. I moved a lot as a kid, too. Even though we weren't poor (low-middle income), I would've been thrilled to choose a new pair of socks, simply because it was something special my mom let me pick out by myself and that she bought for me. I don't think kids know if socks are $1 or $10. My parents rarely treated us to any material possessions, unless it was our birthday or Christmas, or we needed new clothes. I love socks, too (well, in the colder months - in the warm weather, I'm always barefoot unless I have to go outside) and I'm drawn to cute, quirky ones or gorgeous, handmade ones like yours. Anyone who is gifted with your socks is a very lucky person! I would love to learn how to knit socks as I've got the same sock obsession! I wear my coziest socks in the summer heat, too. My daughter rides horses in your little town once per week and I pray for you and your health every time I wait during her lesson. I'm also going in for a mammogram after six years of taking care of my husband and his broken leg, and then helping my daughter through cancer. It's my turn now to be checked and you've inspired me to do it sooner than later. Blessings to you and yours-! Jen, you make beautiful socks!!! I didn't have very many pairs of socks as a child. As I didn't have much of anything, anyway. I so love to read your posts. Pray you are healing and feeling well. Jen, you are just so lovely. Your posts are like a hug. I'm thinking of you & hoping that your treatment and healing are going well. "Bitterness cannot grow where gratitude lives..." Wow. I didn't realize I needed to hear that today until I read your post. In fact, reading your blog is making me think about learning to knit, which I currently do not do. I have a sweet young cousin who has sent me knitted things here and there ... last year a beautiful hat, just because. There is something about a hand-knit item ... definitely a hug. Your work, no matter what it is, is beautiful. It is clear that you enjoy process and the art of the craft :) I am going through a fairly challenging life change myself these days, so I find your blog, photos, and thoughts comforting. Thank you! What a beautiful story! I loved this: Bitterness cannot grow where gratitude lives. What a bit of sage wisdom! I was poor growing up, so I fully understand. I really pity those who seem to have everything. I can't imagine being a child growing up with everything. How would these little things be so special if you had everything? They wouldn't. And what a joy of a message they miss. Such a sweet post and thinking of you as a little girl deciding on which pair of socks to pick. So happy to hear that knitting socks is helping in your recovery. Thinking of you often and praying for continued healing and prayers for your family. Ohhh, I love this post! Such a sad but still happy story. Now I want to learn how to knit! I too have a love for hand knitted socks...Unfortunately I can not master the art of knitting them so instead I buy them from clever people like you. My last pair I bought from a lady in England from etsy....Happy knitting.. I love, love, love having one of your gorgeous creations to call my very own, and the thoughtfulness and bits of you that are knitted into them mean the world to me. I am so happy to hear your beautiful story and that you are learning to "stop and smell the roses" and that you are on the mend. Been without my PC due to problems and I am just now playing catch-up. Your little house reminds me of the one my parents had to rent when the coal mines shut down in the small town where I was raised. I came from a poor family but I wasn't aware of it until we moved to the big city. I had a loving childhood but different from some other families. I love your socks and the colors are so beautiful. Will check back often to see how you are doing. Sending you (((((hugs)))))))) to you and your family. BTW I follow Prudence and the Crow on Instagram because she always does a Socks Sunday post. I love them! Hello, I could relate to you on so many levels. I grew up moving constantly. I never knew the kids next door, the kids in a classroom. And iften, I couldn't remember teachers namers, it all became a blur. We were poor as well. And often children would try to beat us up as their parents told them we were nothing because of our poverty. I had 3 brothers and 2 younger. And we were no cohesive. Mother didn't want a girl so I was a big disappointment that caused great stress for me. We didn't shop the clearance table.. as i was never allowed to attend in stores. Often she would bring home clothes for me from the local Salvation Army, and other children would recognize their old clothes on me. I didn't understand humble. I just lived it. I've never owned my own home~tho its a dream, I'm 60 now and worry, maybe that dream may yet pass me by. Your story was so special and sweet. Thank you for sharing. I love how when you were a little girl, socks were so special to you and now they still are and you are making them yourself. I love the socks you finished they are beautiful. I can tell the love you have for them in your finished work and the lovely details. You are one of those persons who write beautifully about there experiences. Lovely post! What a beautiful blog posting. My husband and I are going through a bit of a stressful time in our life right now getting settled in a new city, with things not going quite as we had planned (hoped?). Sock knitting is my bit of sanity! Thank goodness for socks and wonderful blogs like yours to help take my mind away from the worry for a little while. This is a very sweet post, especially for my first visit to your site. 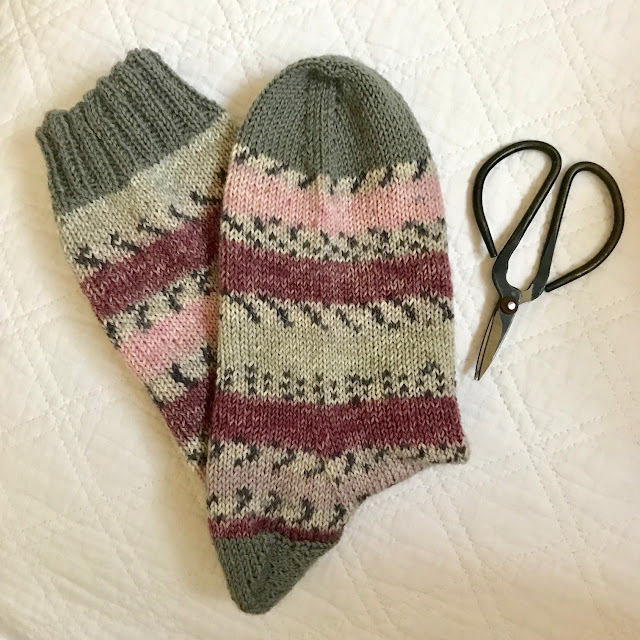 Sock knitting is a favorite for me too - each pair shares the memories of events happening during the time I knitted them, and the colors are fun to pair with my daily outfits. The endless patterns and intricacies add to this beautiful craft. Where did you get your rabbit sock blockers??? They are from a website called the knitting shed and the business is located in England! I love your post as I too grew up very poor. We had simple pleasures. Thank you for making me smile this morning. Your post was so touching. Thank you for sharing. I knit socks for my granddaughters who always look forward to them. 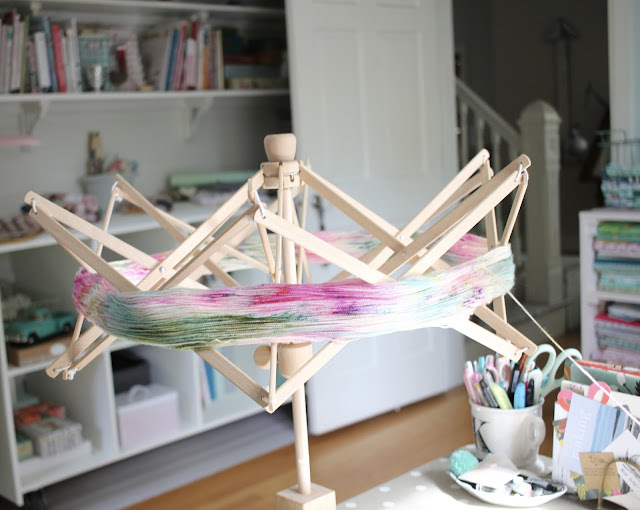 What yarn is the first picture of this post? That is a yarn by Bergere de Goomy and the color is Imprim Beige. Very economical and strong and the color and pattern is lovely! What a beautiful story! I love how socks in general are so meaningful to you and I share you passion for sock knitting. It's a beautifully warm story. I can understand entirely how the little girl you was excited over and so appreciative of those socks. I got that same feeling from my mother, who in turn, passed that love and appreciation on to me. We were very poor. Now that life has evolved, I've become a knitter and though I've only knit for a few years, I've knit a few pair of socks. What a delight to make them and especially to gift them. Thank you for sharing this heartwarming story.